Journal Reference: Gao Z, Y Liu, X Li, and C Lu. 2018. "Investigation of Turbulent Entrainment-Mixing Processes With a New Particle-Resolved Direct Numerical Simulation Model." Journal of Geophysical Research: Atmospheres, 123(4), doi:10.1002/2017JD027507. 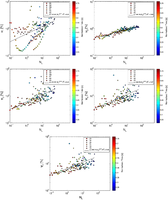 Temporal evolutions of (a) droplet concentration, (b) liquid water content, (c) mean volume radius, (d) mean radius, (e) standard deviation, and (f) relative dispersion. 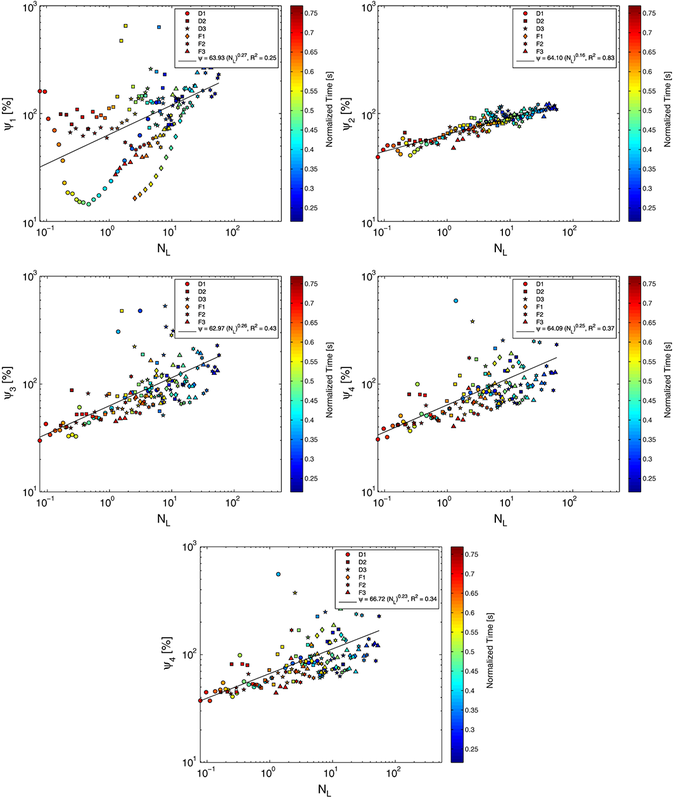 Scatterplots of the five microphysical measures of homogeneous mixing degree as a function of the transition scale number (NL). Each point denotes the domain mean value for the corresponding scenario and time; the symbol and color denote the different simulation scenario and the normalized simulation time, respectively. A new particle-resolved direct numerical simulation (DNS) model is developed and applied to study turbulent entrainment-mixing processes that are essential to cloud microphysics but understudied. Many processes such as entrainment mixing and turbulence interactions occur at sub-LES scales (e.g., < 10 m) and play critical roles in determining cloud properties. However, they are poorly understood, studied, and represented in large-scale models due to limited tools available. This new particle-resolved DNS model provides such a much needed capability to explore such processes occurring at sub-LES scales. 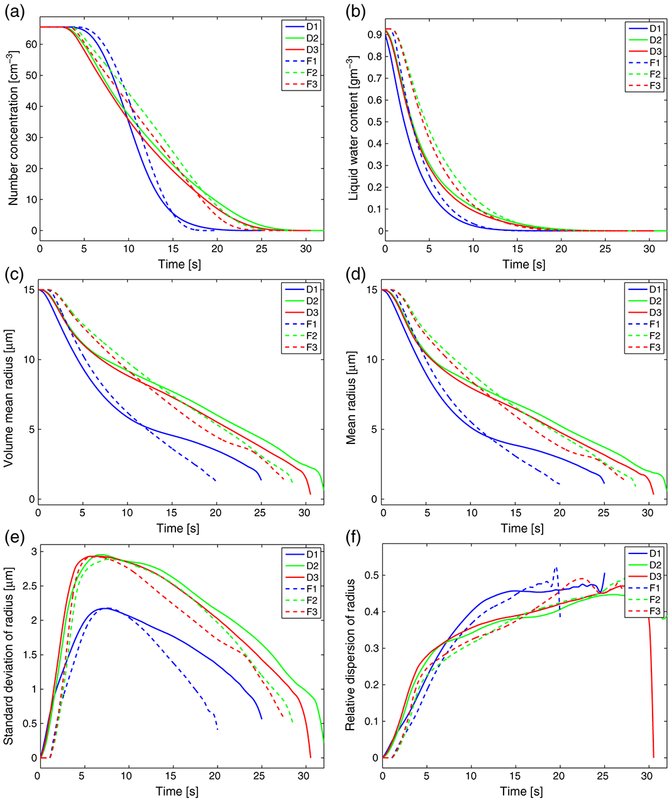 This paper first presents a new particle-resolved direct numerical simulation model by combining the Lagrangian tracking of individual droplets with the Eulerian field representation of turbulence. The model is then used to address the outstanding problem of entrainment-mixing processes and their interactions with cloud microphysics. Based on the comprehensive analysis of the model results, an expression is recommended to parameterize the effect of entrainment-mixing processes on cloud microphysical properties in larger-scale models such as large-eddy simulation and climate models. 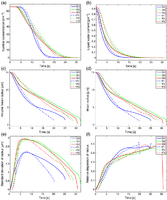 This study is a rare, valuable addition to both the development of particle-resolved direct numerical simulation models and study/parameterization of various turbulent entrainment-mixing processes.